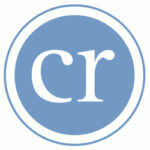 Bishop Rozanski, will you teach my religion class? Following a Divine Mercy Sunday liturgy at Holy Rosary in Fells Point April 27, 11-year-old Michael Chorabik asked Baltimore Auxiliary Bishop Mitchell T. Rozanski to teach a religion class at St. Casimir School. Michael, a sixth-grader at the Canton school, was surprised when the bishop accepted his invitation. “I thought he would be busy,” said Michael, a parishioner of Holy Rosary. 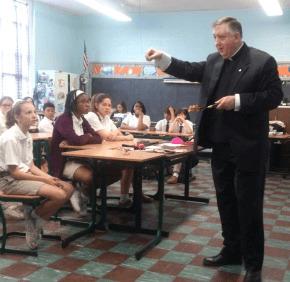 Bishop Rozanski spent more than an hour at St. Casimir’s parish school May 15. “It meant that my small school could have someone so big,” he said. Bishop Rozanski brought items that symbolize his office of bishop, including his miter and crosier. The crosier “is a symbol for me that I am a shepherd,” he said. Bishop Rozanski also brought holy chrism, which is a mixture of olive oil and balsam fragrance used to anoint the newly baptized, to seal candidates for confirmation and anoint the hands of priests and the heads of bishops at their ordination. “When you’re confirmed you’ll have the oil put on your forehead,” he said. Bishop Rozanski said that at the annual Chrism Mass, celebrated during Holy Week, the archbishop consecrates holy chrism and blesses the oils of catechumens, used at the baptisms of those preparing for the sacrament through the Rite of Christian Initiation, and the oils of the sick, used in the sacrament of the anointing of the sick. Students asked Bishop Rozanski two dozen questions, including: what life is like as a bishop; how he discerned his vocation to the priesthood; and how the faithful know God hears and answers our prayers. Bishop Rozanski noted that he oversees 66 parishes in the St. Elizabeth Ann Seton Vicariate, which includes Allegany, Anne Arundel, Carroll, Frederick, Garrett, Howard and Washington counties. As a child, Bishop Rozanski said he was attracted to the work of a parish priest. Bishop Rozanski told students that God talks to them, but perhaps not in the way they expect. Sixth-grader Wynnia Harris, who enjoyed Bishop Rozanski’s visit, said learning about how God communicates with the faithful resonated with her. “God doesn’t just speak to us in the Gospel, but through people we love and care about,” she said. Dena Stewart, a St. Casimir religion and social studies teacher, liked that Bishop Rozanski brought his crosier and miter.